NOTICE: For maximum thematic enjoyment, play this compilation of every Gondor cue in The Lord of the Rings soundtrack from A Magpie’s Nest as you read my article about the White Tree. Enjoy! A solitary stately horn blows a noble note as Lord Boromir stands at the Council of Elrond. “By the blood of our people are your lands kept safe,” he declares as the melody swells. So composer Howard Shore introduces the Men of Gondor in Peter Jackson’s film version of The Fellowship of the Ring. As Boromir gestures, viewers catch a glimpse of his wrist gauntlets, embossed with a simple yet mysterious symbol – a tree spreading its barren branches. Likewise, it is at the Council of Elrond that readers of J.R.R. Tolkien’s work first encounter this essential icon of Gondor. 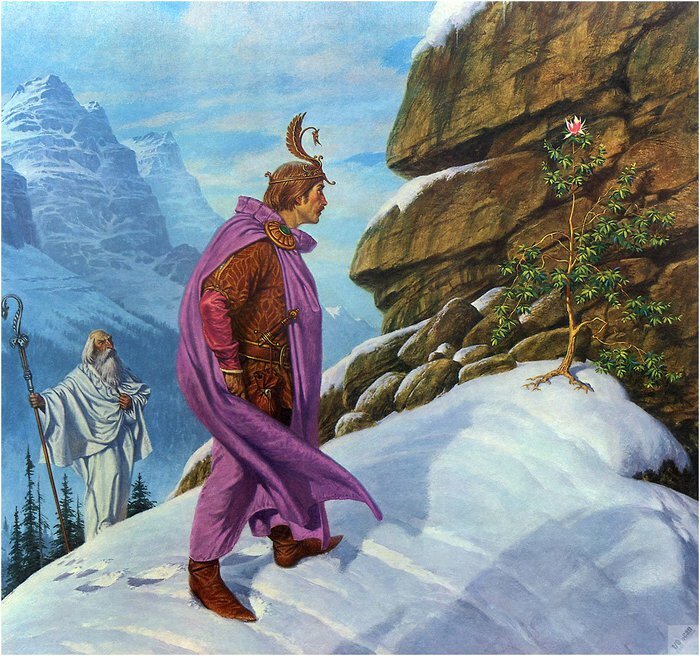 Buried in a chapter dense with exposition, I completely missed the tree allusion in my first reading and was therefore completely confused at the end of the story when Aragorn, freshly crowned King Elessar after the triumph over Sauron, goes for an early morning hike with Gandalf and enthuses over finding a wimpy sapling in the snow. As my familiarity with Tolkien’s lore grows, however, the deep metaphor represented by this tree becomes more apparent. 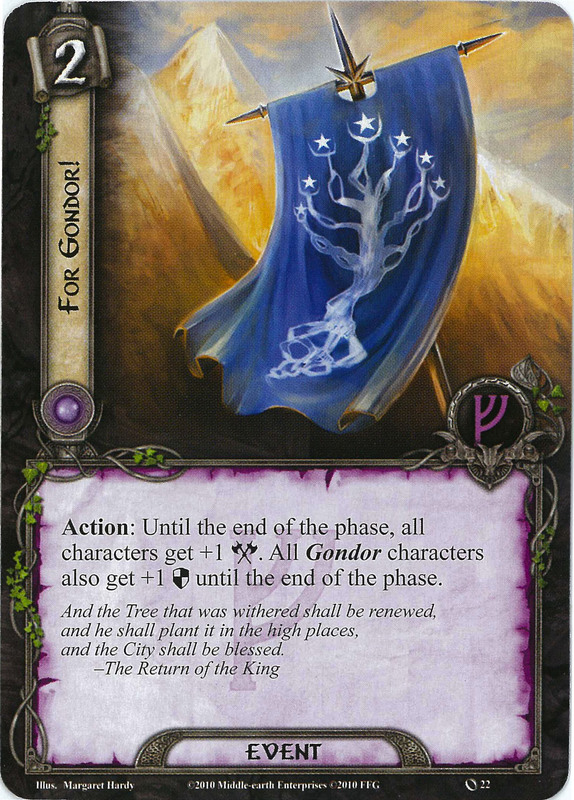 Therefore, when unwrapping the core set for The Lord of the Rings Card Game, I was inspired to see the White Tree banner featured flying on the event card For Gondor! to rally the strength of our Company. 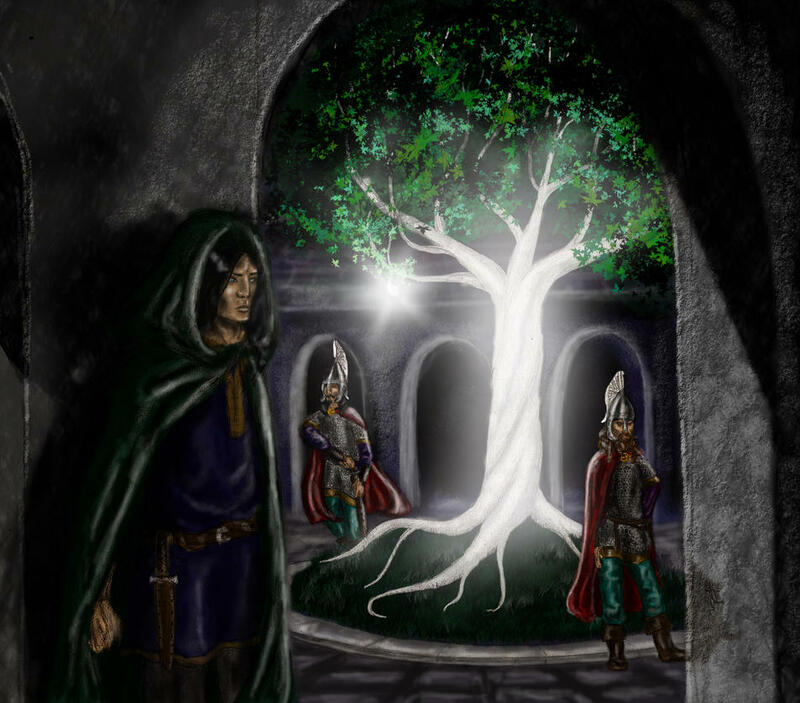 Now, with excitement for our unfolding Against the Shadow adventure cycle peaking, I think it’s a fine time to recount the story of the White Tree of Gondor, that legendary symbol of light and loyalty and life, beaten but not bested, in the land of Middle-earth. There in the courts of the King grew a white tree, from the seed of that tree which Isildur brought over the deep waters, and the seed of that tree before came from Eressëa, and before that out of the Uttermost West in the Day before days when the world was young. 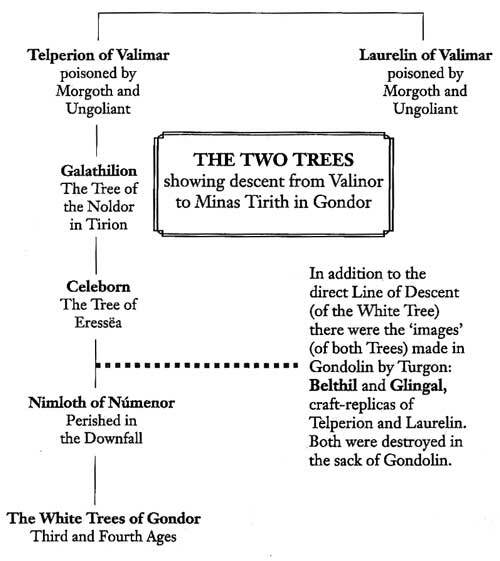 This first reference to the White Tree of Gondor is found in Chapter II of Book II in The Fellowship of the Ring titled “The Council of Elrond”. These lines are stuffed in the middle of a multi-page speech from Elrond that swamps the senses with hundreds of names while summarizing millennia of Middle-earth’s history. 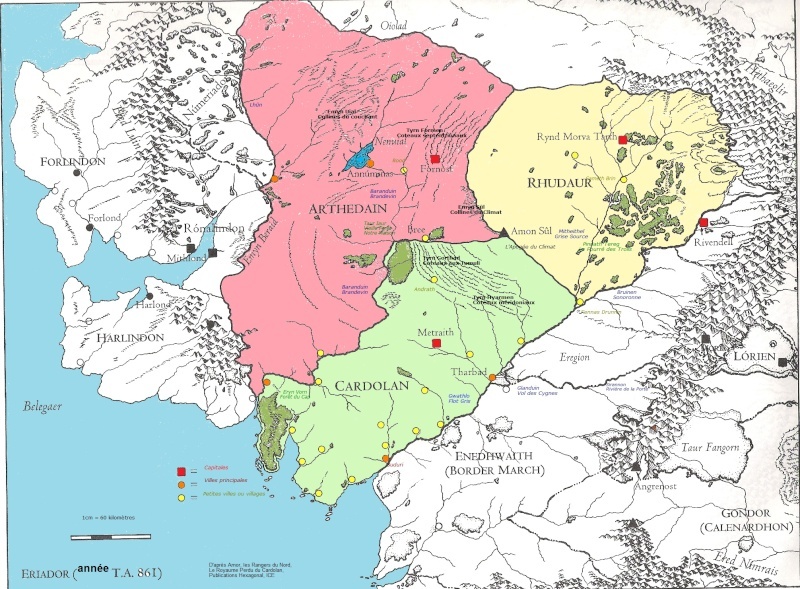 While first encountering everything from Gil-Galad to Osgiliath, Thangorodrim to Gorgoroth, and no less than four tower names beginning with Minas, it’s an easy passage to lose in the mix. But it is, in fact, this description of the lineage of a tree that actually serves as the constant through-line that highlights Elrond’s chief themes and binds the whole narrative together! The story of the White Tree starts in the Elder Days of the First Age before Elves and Men woke up and before the Count of Time even began. There, in newly wrought Valinor, Yavanna sings into being the Two Trees, the oldest of which is named Telperion and first shines forth with “the white glimmer of a silver dawn” inaugurating the Opening Hour of the tale of ages. The Two Trees provide the first light in the world following Melkor’s destruction of the primordial Lamps in Middle-earth and these Trees’ “hallowed” light is the direct source of every significant light that follows – the light of the stars, the light of the Silmarils, and eventually (in their final fruit and flower) the light of the Sun and Moon. As a descendent of Telperion, therefore, the White Tree of Gondor hearkens back not just to the most ancient of days, but a long tradition of establishing light in the darkness and illuminating the shadow. Unfortunately, Telperion did not survive the First Age and is destroyed by the spear of Melkor and poison of Ungoliant. But its likeness does not wholly vanish from the world because of the second characteristic symbolized by the White Tree – loyalty. Throughout the ages, the line of the White Tree is established as seedlings are often gifted as the reward for obedience and commitment to the cause of the Light. 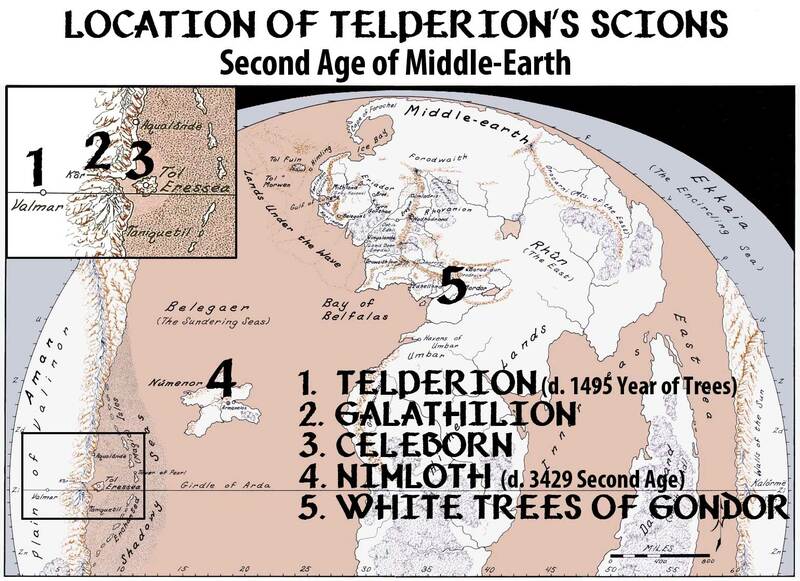 First, the Vanyar and Noldor Elves who faithfully “heed the summons of the Valar” and migrate from Middle-earth to Valinor after their awakening under the stars are blessed with an “image of Telperion” named Galathilion which is “planted in the courts” of Tirion, the Elvish city in Valinor. Next, when the Teleri Elves, who first lingered in Middle-earth, finally show their loyalty to the Light and come West across the sea on Tol Eressëa, the “island ferry”, they receive a seedling of Galathilion named Celeborn which “prospers” there. Finally, as the First Age closes with the defeat of Morgoth, the Edain, who “alone of the kindred of Men fought for the Valar”, are granted as reward the island of Númenor for their home. When Elves from Eressëa come to visit these loyal Men, they bring gifts borne of their friendship, including a seedling of Celeborn named Nimloth which “blossom[s] in the courts of the King” and fills “the shadows of night with its fragrance”. Loyalty to the Light, therefore, is the key criterion by which the Tree is passed through history and the chief virtue by which Men would muster under the banner of Gondor. This virtue of loyalty, however, can be fragile and is ever threatened by darkness and death. In the same way, the descendents of Nimloth are destroyed at several points in the tale, echoing the original darkening of Valinor in the destruction of the Two Trees. Yet a shoot always remains as a symbol of rebirth, hope, and a righteous remnant of the faithful. 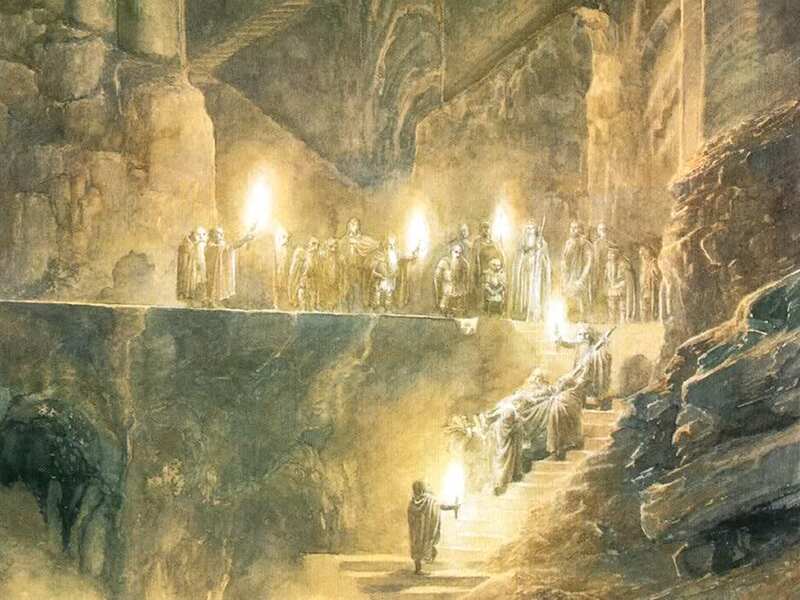 During the Second Age, as the Kings of Númenor become corrupted by Sauron’s council, they begin a cult of human sacrifice to Melkor in the King’s city of Armenelos. The “first fire upon the altar Sauron kindle[s] with the hewn wood of Nimloth” which emits a “reek” and “cloud for seven days”. But not all light and loyalty is gone from the race of Men. Not long before, Isildur, who was one of the heroic Faithful of Númenor before his later entanglement with the Ruling Ring, hears the tale of the Two Trees, disguises himself, and sneaks into the King’s court at night. He steals a fruit from Nimloth and fights his way past the King’s corrupt guard without being captured or identified. Although sustaining critical injuries in the battle and “come near death”, when the fruit is planted and “a shoot [arises] from it” Isildur’s loyalty is rewarded and he is immediately healed when the tree’s “first leaf” opens. This sapling is the one at Isildur carries with the Exiles into Middle-earth and plants in Minas Ithil after Númenor is drowned and the kingdom of Gondor is established near the end of the Second Age. In the conflicts of the Third Age between Sauron and Gondor, the White Tree is killed twice more, but each time a seedling remains to preserve the line. But by 3018 and the events of The Lord of the Rings, the third White Tree has been dead in Minas Tirith for 166 years and no further descendents can be found. For the first time since the dawn of Time, it seems the Light of the Eldest Tree has finally passed entirely from the world. Yet even as the White Tree stands rotting in the Court of the Fountain, the banner of Gondor still waves, reminding Men of their ancient loyalties, stirring them to great deeds, and spurring their last stand against the shadow. And so, as Gandalf says, this White Tree is not simply a symbol of Gondor, nor the Kings. Rather, it represents the light of the stars and moon and the loyalty of Elves and Men over three ages of the world. The White Tree is a reminder that even when all seems beset with darkness and the firmest faith is broken, there is still life that can break through winter’s frost and spring forth anew. 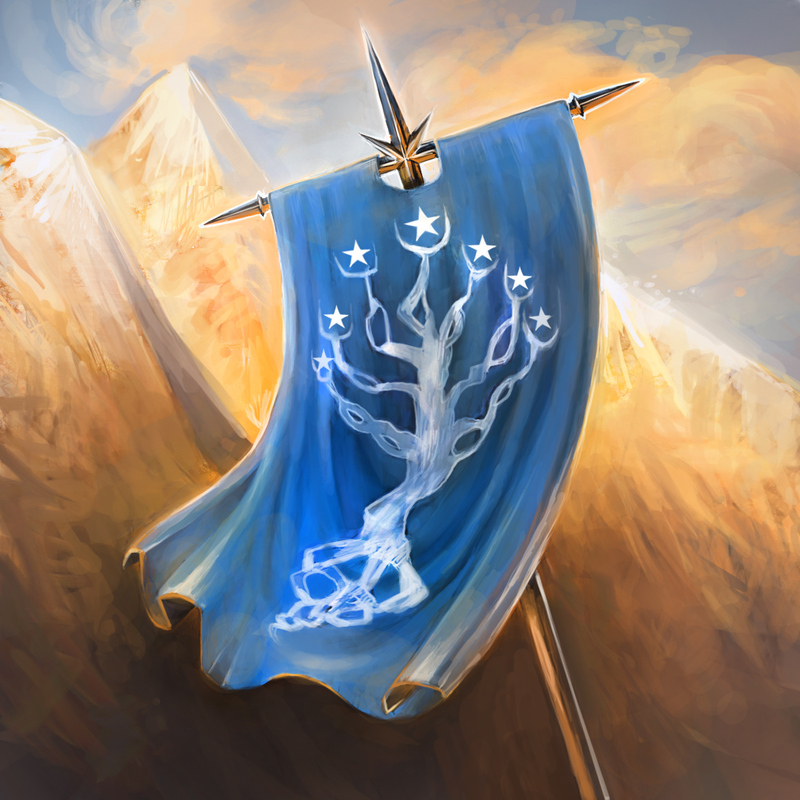 The “battle standard of the White Tree” on For Gondor! was painted by Margaret Hardy, a self-professed “huge Tolkien fan” who works in the movie poster industry while she develops her own independent comic project. Ms. Hardy says that the “golden rule for the art in this game was to create an inspired vision that rings true with the original source material (J.R.R. Tolkien’s literature)”. That’s what we love about FFG’s handling of the license here at Master of Lore! Check out Ms. Hardy’s art blog and portfolio to see more of her fantastic work. Thanks Margaret, for sharing your experience and this high resolution version of our featured piece! 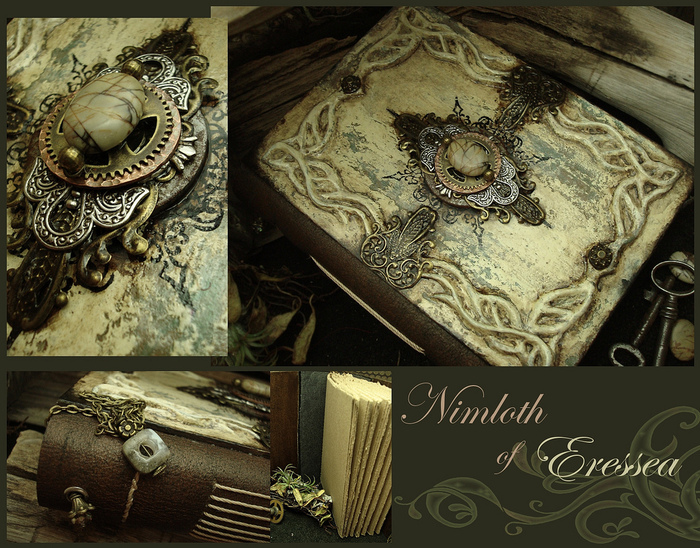 The second piece that we want to admire today is a gorgeous, handcrafted journal based on the Nimloth the Fair, the white tree gifted to the King of Númenor by the Elves of Eressëa. The white jasper stone represents the lone seed of Nimloth which Isildur successfully rescued from Númenor while the hand-sculpted clay roots are designed to “lay dormant but not dead, awaiting patiently for the return of the King to once again spring to life”. Luthien Thye is a Malaysia-born artist who has been following her passions since leaving behind her accounting job, creating “unique jewelry and art journals, mixed media and assemblage”. Although she is currently taking a break from commissions, you can see more of her incredible pieces at Altered Alchemy. I wonder who is the lucky soul currently holding that Nimloth journal! For our final feature today, we turn once again to the esteemed Professor Tolkien himself. This time, however, it is not his art but rather his poetry that we want to appreciate. In The Return of the King, when the Ring is destroyed in Mount Doom and the Captains of the West triumph at the Black Gate, the tidings are brought back to Gondor by a “great Eagle flying”. 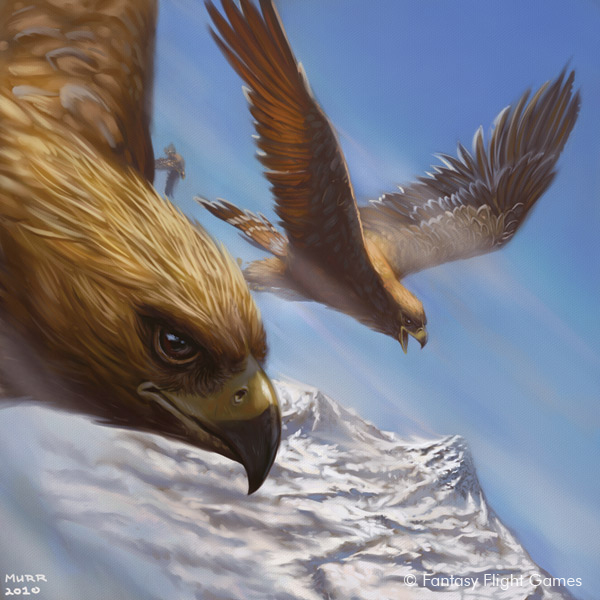 The Eagle brings his report in song, a passage of which is the flavor text on For Gondor! : “And the Tree that was withered shall be renewed, and he shall plant it in the high places, and the City shall be blessed”. Check out the full annotated lyrics of “The Eagle’s Song” and listen to this incredibly cool voice recording of J.R.R. Tolkien reciting it! For Gondor! is a simple and straightforward event card that’s been given excellent thematic treatment. As we have seen, although the White Tree is the symbol of Gondor, its lore is “older far” and touches all Free Peoples of Middle-earth. As such, it is thematically appropriate that all characters are rallied by its image to a +1 strength bonus while Men of Gondor, especially inspired by their national icon, also receive +1 defense. 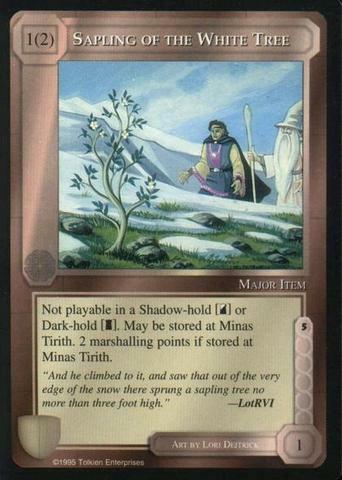 Sometimes the cost of 2 seems a bit expensive for this effect and I can’t actually remember the last time I’ve used it in my decks, but thematically the cost works by making it unlikely you’ll be playing this card unless you have Steward of Gondor accelerating your Leadership resources to pay the price! 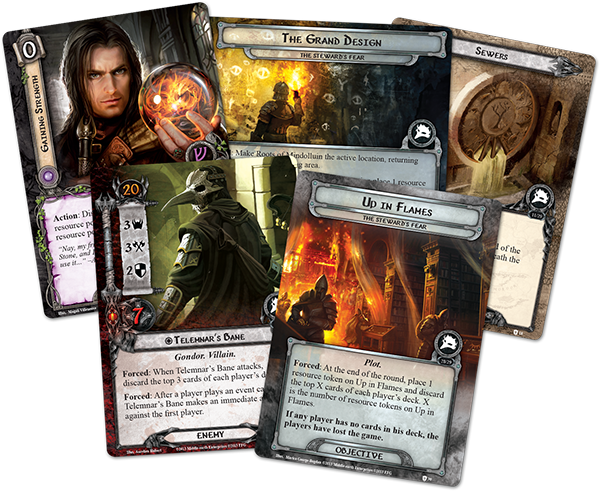 With Heirs of Númenor encounter cards like Market Square, Lossarnach Bandit, and sweaty Pickpocket stealing resources from your heroes, using the Wealth of Gondor should play well with For Gondor! to make sure you can get it on the table. Facing the prospect of more battle questing and further development of the Gondor trait, I expect this card to be getting a lot more play in my decks soon! Aragorn and Boromir lead the Gondorian army to victory over Sauron’s minions! The image above is just a fantasy in terms of actual gameplay, but after learning more about the White Tree, I’m definitely going to give a Gondorian deck like this a try! A few decent Gondor decks have been proposed by our friends in the community and these can only get better with coming adventure packs. Check out ursine blogger Beorn’s “Two Kingdoms Reunited” deck and Jason’s “Blood of Gondor” deck for a couple Leadership-Spirit decks that include Eleanor. Here’s Papo’s “Gondor 2 Player” deck that utilizes Lore-Tactics and should cooperate with a Spirit Rohan counterpart. Deck strategy is admittedly one of my weaker areas and I’m sure there’s a great Tactics Boromir deck running around somewhere out there. Any tips? Finally, I’ve recently enjoyed Cardboard of the Rings’ custom card design contest for Snowbane and been playing around with GeckoTH’s custom card templates at Board Game Geek. 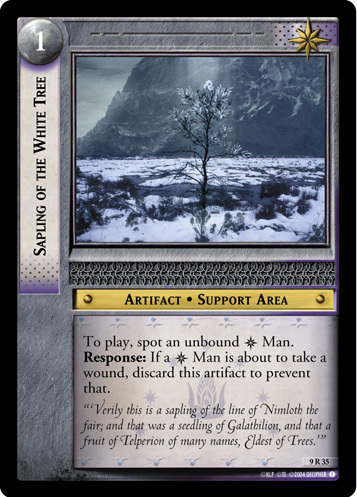 The past two game licensees for The Lord of the Rings made cards for the sapling of the White Tree that Aragorn finds in The Return of the King and with our upcoming exploration of Gondor, I thought we should have one that we’re looking for as well! I am sure I could figure out a good Tactics Boromir deck for you based around the Gondor trait if you are interested. Another fantastic article. You truly are our community’s Master of Lore. Thank you sir! 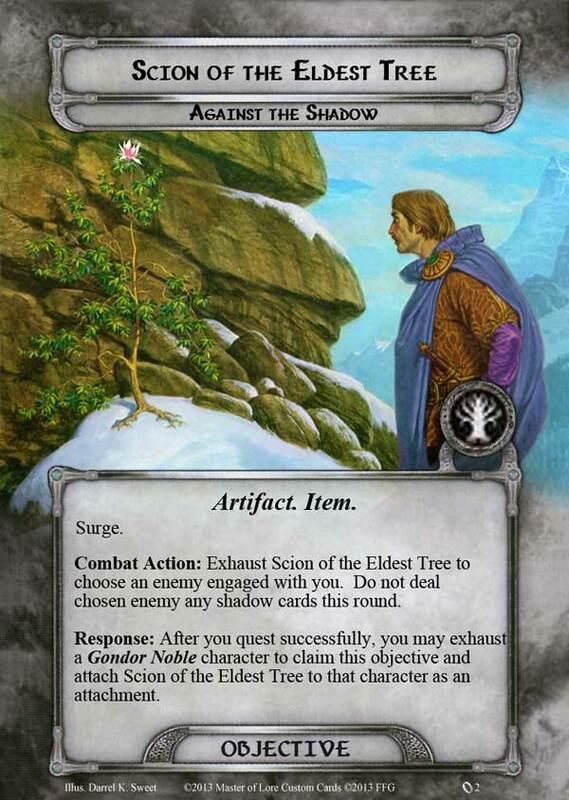 I would be interested to see a Tactics Boromir deck based on the Gondor trait. This is the solo deck that I was able to use to beat Into Ithilien and Siege of Cair Andros, but (as I mentioned in my Eagles are Coming! 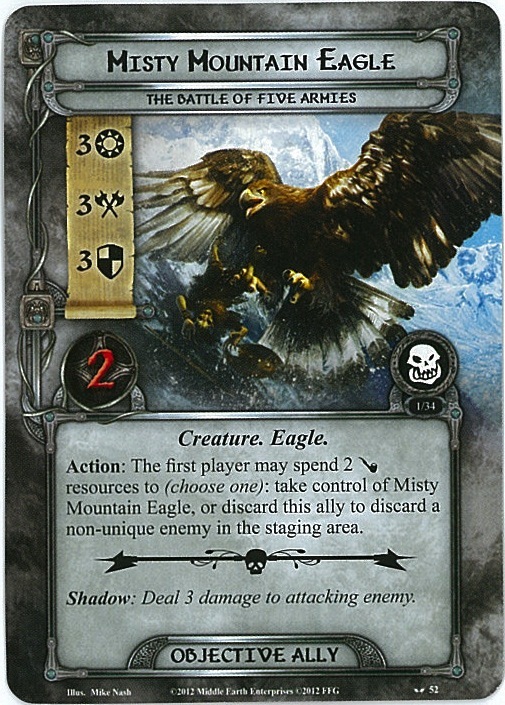 article), thematically I’m not a big fan of how the Eagles work, so I’d love to make it more Gondorian. Deck Strategy: Boromir does it all! Especially if he can get Support of Eagles and the Eagles of the Misty Mountains gets stacked. Mulligan if no Light of Valinor or Spirit events in opening hand. OK, I tried to make a deck based on For Gondor! The idea is build an army as quick as possible, using Envoy of Pelargir or Wealth of Gondor to give Beregond resources when necessary. Otherwise Steward and Horn go on Boromir (hopefully in first round). The idea is to use For Gondor! and Grim Resolve to power through battle and siege quests and swarm on enemies. Also, Stand Together with an army of Gondorian Spearmen (and Spears) can hopefully take out enemies with defense. I haven’t tried this out yet, but it should be quite thematic if it doesn’t get destroyed in the first couple rounds or run out of resources! On your Scion of the Eldest Tree card, that second action should probably be labelled as a Response. Ah, good point. I’ve updated it accordingly. Thanks for reading and I hope you enjoyed the article! Tactics Boromir doesn’t seem like the Superstar of the deck but trust me, he is. This deck is highly themed to Gondor. 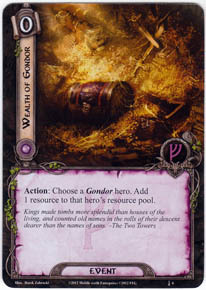 There should be a wealth of Resource Gain, Card Draw and Threat Reduction (the later two through the reuse of Gandalf with Sneak Attack). One Will of the West is included once you get out Celebrian’s Stone you should be able to reshuffle to replenish useful cards once again. Grave Cairn is in there for more boost to attack on Boromir especially with a play of Sneak Attack Gandalf. The bonus from Grave Cairn lasts the ENTIRE round once the character leaves play, allowing for a really nice boost for Boromir to eat multiple enemy. Give it a whirl and let me know how it played. I tried the deck out tonight and went 1-1 against the Siege of Cair Andros. My first game was full of resources and was doing well enough and had removed stages 3 and 4, made it past stage 1 and ended up threating out on stage 2 with 4 progress on it and all Heroes alive. I played again and removed stage 2, 4 and 4. Finished off stage 1 and moved to stage 5. I quested heavy using Battle and placed 12 progress. Unfortunately I was engaged by a Mumak and Orc Vanguard. They proceeded to kill Boromir and Prince Imrahil. The next round found myself with Aragorn heeding the signs of 2 Dunedain Marks. He quested in the last ditch attempt and wound up circumventing a Battering Ram to place the last 3 progress and winning the game. I like the deck a lot. It is surely something that could be tweaked a bit but all the pieces are there. I am pretty sure the Steward of Gondor should be on Aragorn of course to make him Gondor but it seems a better play on Imrahil. With the Horn going either way to Boromir or Aragorn. 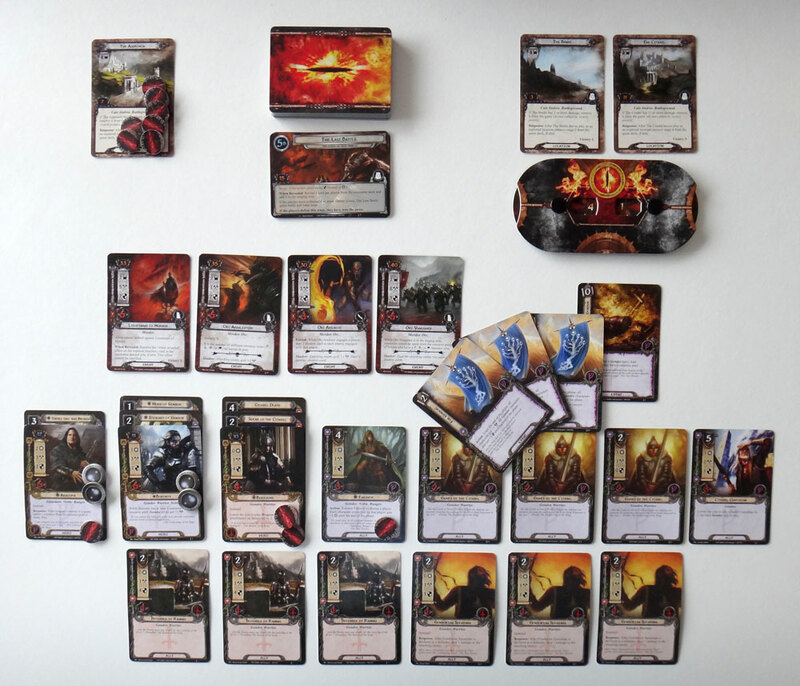 I was able to beat Siege of Cair Andros on the second attempt with your Gondor deck! Moreover, I got to use For Gondor! to boost my defense just enough in the first stage siege quest to save The Citadel. That’s the thematic joy I’ve been looking for. Getting the Gondorian Shield on Boromir in the first round was essential. Losing The Banks to a Siege Raft meant I needed to pass through stage 2B, but I got lucky and drew Scourge of Mordor (discard from player deck to add threat) and Orc Assault (-2 strength, -2 defense) so I survived the traditional willpower quest. You’re right; Boromir was the star! Thanks for the awesome deck idea. Who said Gondor synergy can’t do anything yet? Now I want to swap in some more of Aragorn’s artifact attachments and take this deck for a run on Steward’s Fear next. I’m planning to give this deck a try soon too. I’ve still barely played Seige at Cair Andros, and I’ve rarely used Tactics Boromir (well, either Boromir) in a deck yet, so it’s time to kill two birds with one stone! He’s a super fun card to play and well suited both thematically and strategically to the “Siege at Cair Andros”. Enjoy! Hastur360, I tweaked your deck for “The Steward’s Fear” and had some fun making my first YouTube recording of a playthrough yesterday evening. Thanks again for getting me really cooking with the Gondor trait after my first woeful attempt! Wow! Now that looks like the kind of deck I want to play Siege at Cair Andros with! I’ve been playing solo and I’m too stubborn to use Dwarves (ironic, huh?) so this weekend, I put together a deck with Elrond, Glorfindel (FoS), and Frodo. I was able to beat the scenario, but the Tolkien geek in me isn’t going to be satisfied until that can happen thematically with Boromir blowing his horn, leaping off the ramparts into battle and crying out “For Gondor!”. You sir, have now given me that chance. I probably won’t get to play again until next weekend, but I will be sure to let you know how it goes. THANK YOU! Again, what a complete article and experience with audio! Haha! I especially like the family tree of the trees! Ha! I can’t wait to play through the dream chaser cycle, checking in on ruined Numenor seems so exciting!